Are you suffering from adult acne? But take a look carefully at where you’re breaking out. Traditional Chinese medicine maintains that a weakness or toxicity in a certain organ or gland in the body can result in acne showing up in certain areas of the skin. Such a theory of face mapping suggests the location of your acne could present clues about what’s causing it. Forehead: Pimples here are usually linked to the digestive system, and may indicate that you’re having a hard time breaking down certain foods. Try eating digestive enzymes like bromelain (found naturally in pineapple) and papaya before each meal to help break down foods. It may also indicate liver problems, stress, or an irregular sleep schedule. If you suspect liver issues, try some dandelion tea or some extra garlic and onions, and make sure you’re getting 7-9 hours of sleep each night. Drinking hot water with lemon (Try WAC Teabiotic Morning After Magic Dust or WAC Teabiotic Coltcha Magic Dust ) in the morning can help with the detoxification of liver. Or maybe you are gluten intolerance? Try to avoid gluten (think wheat, rye) completely for a few weeks and see if the condition improves. Cheeks: If you spent time in the city, on the road for hours, or came into contact with polluted air, that may explain pimples showing up here. And unfortunately, the indoor air in our homes and offices can be just as bad, or worse! Consider growing indoor plants that help improve quality of air. Sometimes, acne here can be a symptom of too much sugar in your diet. So try to go sugar-free for a few weeks and see if that helps. Chin: We know that it’s that time of the month for you, when we see chin pimples. Chin pimples often come around because of changes in your hormones. In the days before your period, try to pay extra attention to your skin care. Consider eating foods that help regulate your natural hormonal cycles. 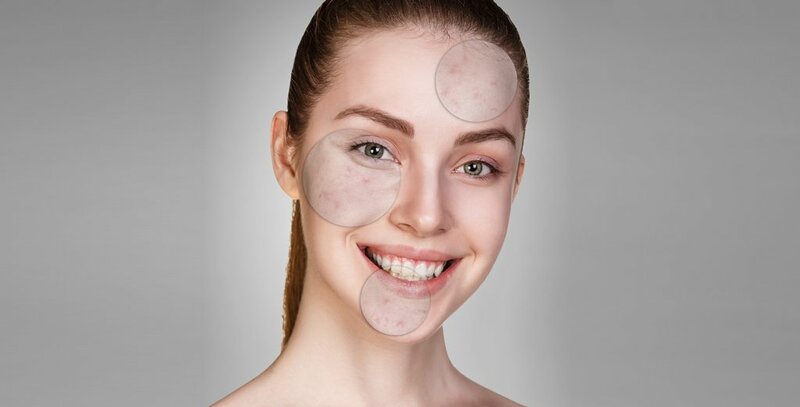 If you’re noticing a direct relationship between dairy and acne, you should eliminate the dairy from your diet in all its forms for one month, allow the skin to calm down, and then re-introduce slowly to see if acne develops. It’s thought that dairy contains components related to testosterone which stimulates oil glands in the skin. The #FutureOfSkincare is now here because Esse Probiotic Skincare created the world’s first live probiotic serum – Probiotic Serum and Sensitive Serum contain live probiotics to be applied on skin to help combat acne, as well as other types of skin inflammation. We also recommend to supplement with intake of Probiotic Tea and Probiotic Supplements. Come visit our wellness boutique at Thomson Plaza #01-07 to find out more!